Walking into the village on a pleasant, sunny day, you cheerily greet other passers-by with a smile and friendly, “Jambo!” (hello). You’re a simple trader, minding your own biashara (business), just trying to support your mke (wife) and watoto (kids). Buying hariri (silk) and manyoya (hides) at modest prices and selling them for higher sums, perhaps you’ll even earn a little extra to buy that shiny, new mkuki (spear) you always wanted. It is a concept as old as ustaarabu (civilization) itself. Is that too much to ask? But no, apparently the life of a simple trader is not so simple after all. That mbaya mtu (bad man) across the square has to go and send his tembo (elephant) rampaging over to upturn and trample your soko kusimama (market stand). What a maana mtu (jerk *loosely translated)! Well, how about you send your fisi (hyena) over to cause some mischief of your own. That’ll show him! Turns out, this trading business sure can be kata-koo (cut-throat). 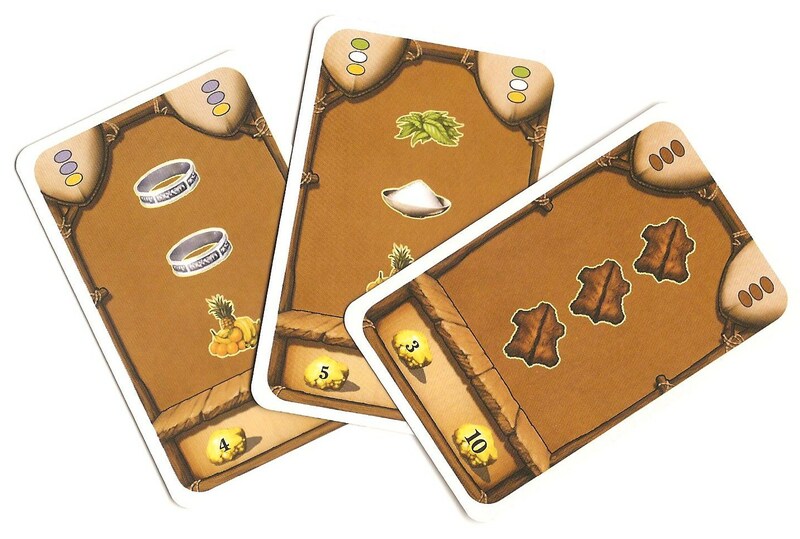 Jambo is a two-player only card game of trading wares to earn gold (part of Rio Grande’s Kosmos series). To be clear, it is not a collectible card game, but it trends like one. 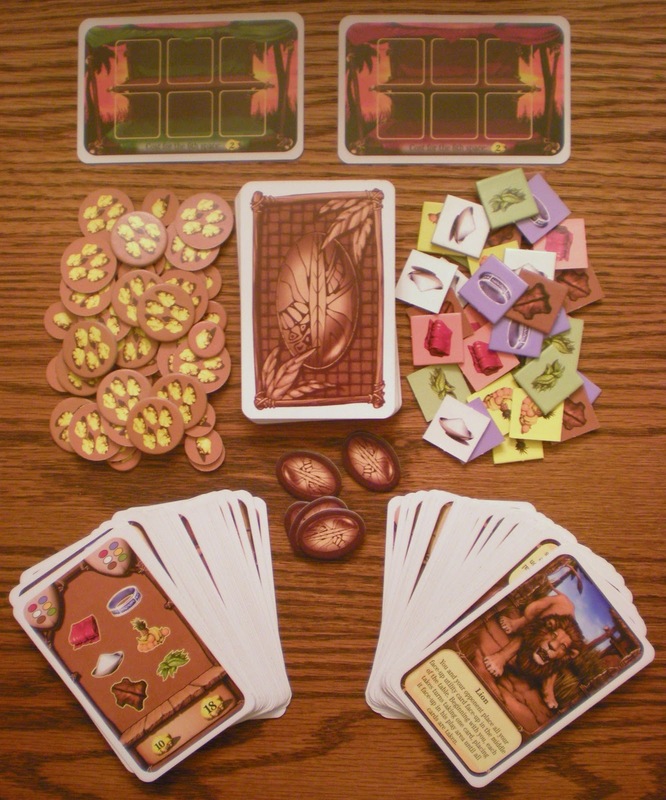 Both players begin the game with 5 cards, 20 gold, and a market stand that has enough space for six wares. The main goal, as in so many other simple economic games, is to buy low and sell high. Buying and selling are both accomplished by playing ware cards. 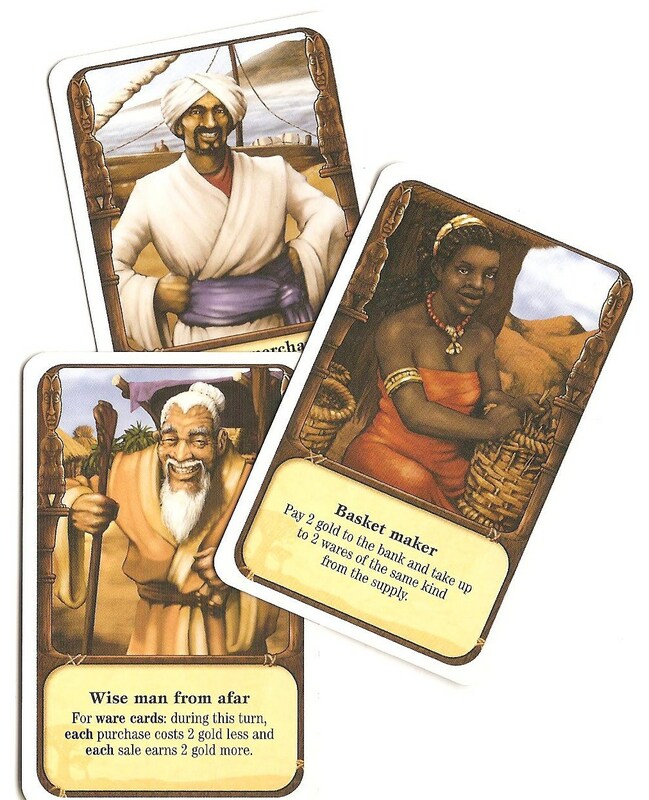 Each ware card depicts three of the game’s six available goods (fruit, hides, salt, silk, tea, or trinkets) along with both a purchasing and selling price. To buy wares simply play the card, pay the cost indicated in gold, collect the goods depicted on the card, and then place them in available slots on your market stand. 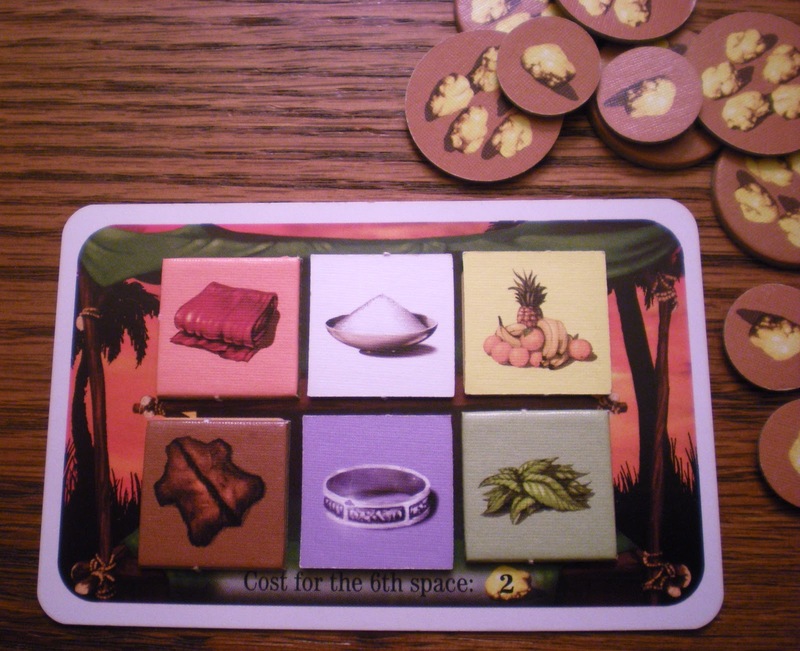 To sell wares you must play a card that matches goods that you already own on your market stand, return those to the supply, and then collect the amount of gold indicated. So far, very easy, very pleasant, very…boring. Sturdy cards with nice artwork and solid tokens. 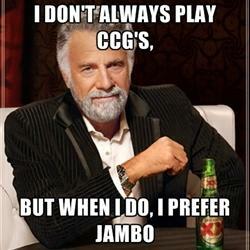 Thankfully there is much more to the game then merely buying and selling; and that is where Jambo earns its CCG feel – and creates a great deal of strategy and fun. Each turn, you have five action points to spend. To begin, you may spend one action to draw a card. If you don’t like it, you can discard it and spend another action to draw a second one. In this manner, you may continue drawing and discarding and drawing until you acquire a card that you like or run out of action points. You can also skip the draw phase, if you wish. After drawing, you spend the remainder of your actions playing cards – one card per action. In addition to the ware cards, there are many other types that let you manipulate the rules, pile on the wealth, or mess with your opponent. Some of these cards offer one-time effects, while others might remain in play for many rounds or for the rest of the game. Utilize those utilities to best advantage! Utility cards, denoted by a bamboo border, are played in front of you and offer long term benefits that can be activated once every round at the cost of one action point. As such, you can only have three in play at the same time. 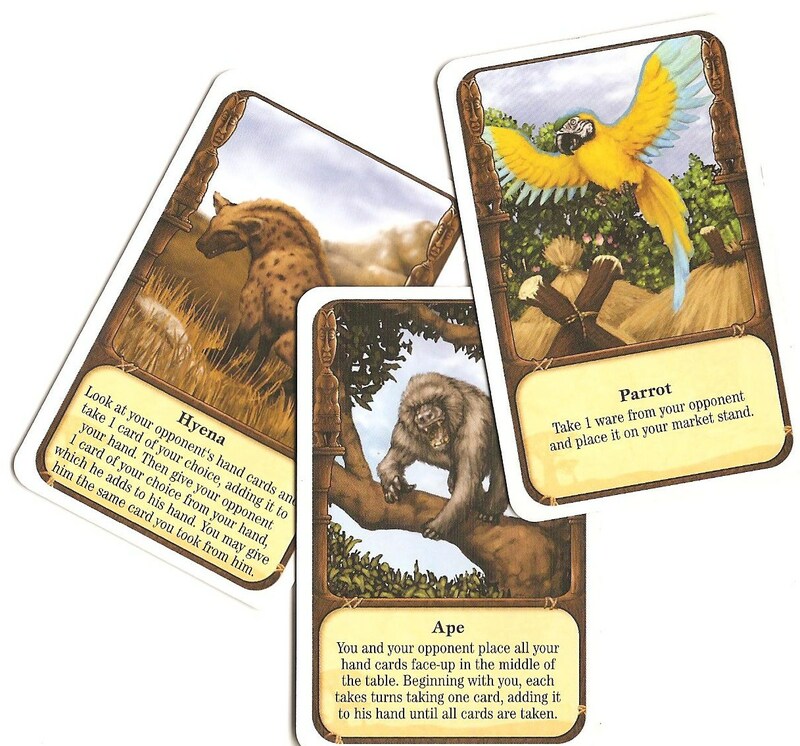 If you wish to play a fourth utility card, you must discard one of the three already in your tableau. These offer a variety of ways to bend the rules and/or interact with your opponent, though usually they are of the “self-help” type. For example, ‘Boat’ allows you to discard one card and take a ware of your choice from the supply. ‘Kettle’ allows you to discard 1 or 2 cards and draw an equal number. And ‘Throne’ lets you exchange a ware from your market stand with one on your opponent’s. People cards are unique and grant a one-time benefit. These special abilities affect different aspects of the game and will often vary widely between players in popularity based on preferred strategy and/or a particular game’s progress. For instance, ‘Psychic’ permits you to look through the top 6 cards of the draw pile and take one for your hand. ‘Dancer’ lets you play one ware card and sell any three wares of your choice from your market stand, without having to match those on the ware card you choose. Most will concern only you, but a few involve some sort of interaction with your opponent, as well. Along those lines, ‘Merchants’ allow you to put up cards or wares for auction, with the prize going to the highest bidder. ‘Carrier’ gives you the choice of taking 2 wares from the supply or drawing 2 cards, but your opponent gets to take the action that you did not. There are also a couple of people cards that can be played on your opponent’s turn, without the cost of an action point. ‘Rain Maker’ lets you take a ware card which your opponent just played/discarded. And ‘Guard’ protects you from animals. Animals can mess you up! Those animal cards bring the real pain…and fun. These are special cards which can royally mess with your opponent. Like the people cards, the powers here vary quite a bit and will be attractive to different people based on play style and particular circumstances. Some are no-brainers, like the ‘Parrot,’ which allows you to steal one ware from your opponent’s market stand. Others will be played largely depending on circumstances. There are animals that force both players to line-up their wares or cards together for alternating selection, beginning with the person who played the animal card. Still others provide a balance that can offset your attack with some affect on yourself, such as ‘Snake,’ which causes both players to discard all of their in-play utility cards but one. So, you must be careful to play many of these at an opportune time in order to maximize the hindrance to your adversary while minimizing any side effects to yourself. The game continues each round with players spending their 5 action points and then turning over play to the next. If you end your turn with 2 or more action points remaining, you may take 1 gold from the supply. When the first player to earn 60 or more gold ends his/her turn, the second player gets one more turn. If the second player can tie or exceed the first player’s total gold, then he/she wins. Otherwise, the first player holds on for the victory. The Most Interesting CCG in the World? As a card game, luck is inherently a factor. Sometimes, the nature of the draw will create some oddly slow stretches in the game as the players wait for that one card that will start setting things in motion. I would not say it is a problem, but merely a minor nuisance. Will you have a game now and then where the “luck of the draw” seems to defeat you at every corner no matter what you do? Sure. But those games will be the exception rather than the rule. There are just too many ways to work with, and minimize, the randomness of Jambo. Just like in a CCG. In many ways, the phrase “multiple paths to victory” applies in Jambo. There are cards that let you draw more cards. Cards that let you stock up on wares. A couple allow you to sell goods without having a ware card. Others let you just outright collect gold. Still others let you look for specific cards in the draw or discard piles. And if you are still having trouble helping yourself, then you can acquire and play cards that hinder your opponent. There is also a beautiful balance to this cornucopia of cards. Some provide a simple benefit to you or straight-forward attack against your opponent. However, the more powerful cards include some sort of counter-effect. The benefit that a people or utility card provides you may throw your rival a bone, at the same time. Conversely, the animal card you play to attack the other might make you feel the pinch, too. You will need patience and strategy to use your options wisely. To be sure, the value of some cards are questionable as to their worth and overall balance. But that will depend on an individual’s preferences and play style. Just like in a CCG. The six wares and the market stand. The most obvious contrast between Jambo and CCGs is the market stand and economic aspect. Instead of using card powers to take out your opponent’s fighters, your ultimate goal is to buy and sell. As such, there is not a tableau building mechanic, per se, as other card games have. 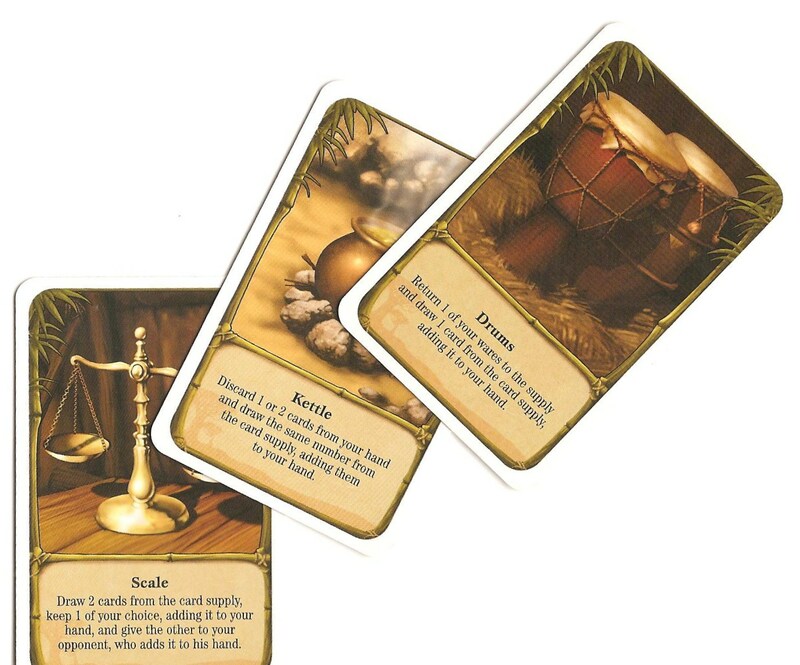 Instead, the cards are used to manipulate the economic mechanics in collecting and selling wares. While discussing the wares, I’ll also add a quick note about the components: they are top notch. The card stock is good quality. The ware, gold, and action tokens are sturdy and sized nicely. The cards themselves are designed very well, and similar to those in CCGs. The layout is orderly, the text is clear and concise, and the artwork is pleasantly natural. The box even has an insert that is actually functional! Did I make clear that Jambo is NOT actually a collectible card game? Okay, just making sure. You don’t build your own deck. You share a common draw pile. Apart from a couple of small, appealing expansions, you don’t need to sink weekly paychecks into pack after pack of boosters to really have fun. But the card design/text, unique variable powers, rules, and tableau mechanic will give that sophisticated CCG player just the right flavor to scratch that itch – and in one compact price to boot. Yet on the other hand, Jambo is also a smooth, interactive, strategy game perfect for couples and other casual gamers not already familiar with the world of CCG’s.